TWO premieres of class assignments tonight, as an apology for my lateness (I’ll explain later). 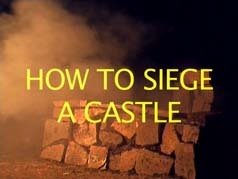 First, my first assignment from my intro to filmmaking class this semester, a silent short I co-directed with John Keefover, Nick Kelley and Jacob Nollette called Don’t Have a Cow, and a video I made for my high school speech class with Chris Doyle and Evan Riffe called How To Siege A Castle. Enjoy. 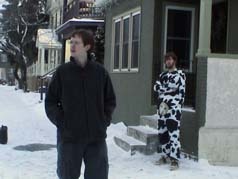 don’t have a cow is great, was that a fake bible? because I would find it to be a great relief if you and nobody you knew actually owned one. Yes, Micah, that is in fact the case. I have yet to check out the cow one, but from previous experience the castle bit is very good, particularly editing for such an undeserving class. I love the preview for next time.